I wanted to update you all on Baby Miss’ progress for our “Letter of the Week”. We have been at it for a month now, and we are currently on the letter D.
As most of you know from a previous post, I have been working on not only teaching Baby Miss a letter each week, but we also have a color, number, and shape of the week. It’s been going beautifully. 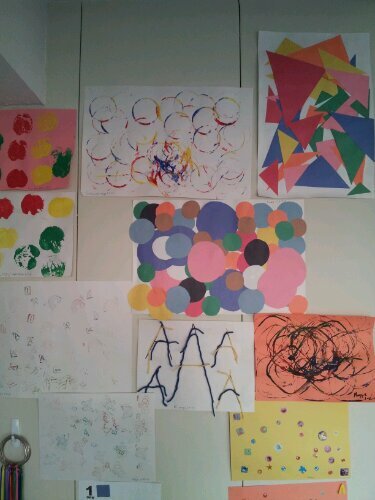 I try to do some sort of letter activity each day, and as many number, color, and shape activities as I can (since those cycle through more then the letters on our educational calendar). 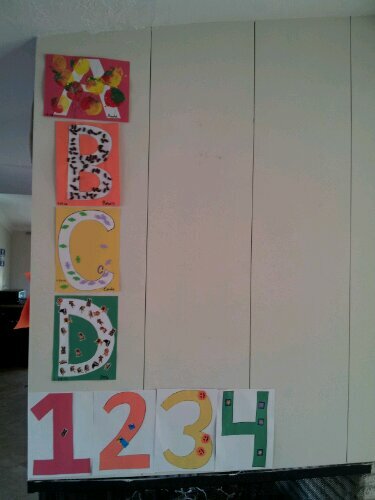 She has been having a blast decorating our new letter and number each week. A had apple prints on it. B had beans. C had leftover foam “candy” stickers from Halloween, and D has dog stickers all over it. Each number has a certain type of something on it. For example, the number 2 has 2 cookie monster stickers on it, 4 has 4 star stickers on it, and so forth. 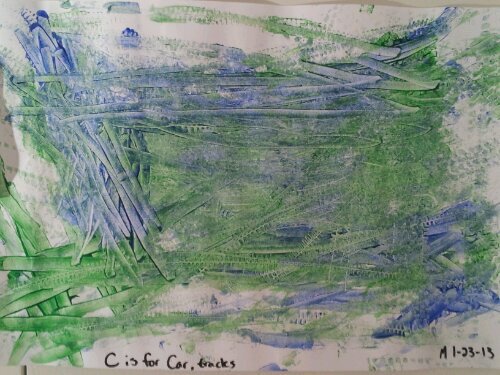 What do you get when you mix paint with cars? Car tracks! 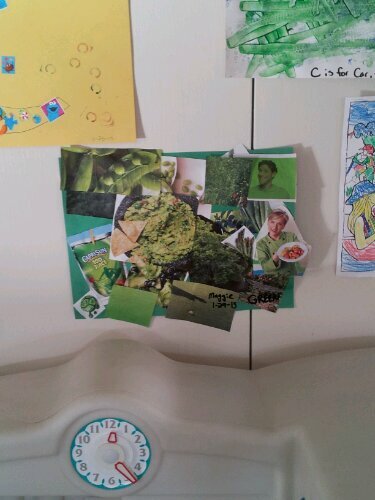 We have also been doing lots of stamping, collaging, printing, and painting. I try to change it up each day. We also do some color mixing when learning about a secondary color (ie. blue + yellow = green). I am basically trying to “surround” her with the new material and talk about it as much as possible (point out a RED stop sign or a SQUARE box) to help her absorb it. 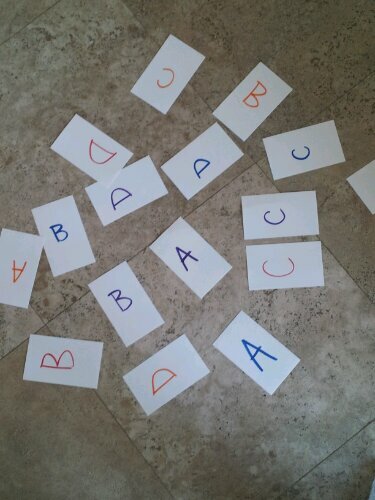 One of my favorite activities that I have come up with is a number matching and a letter matching game. Obviously we couldn’t do it the first week with only one letter, but I like it because it helps to review the old letters and numbers each week while helping her practice the new one. 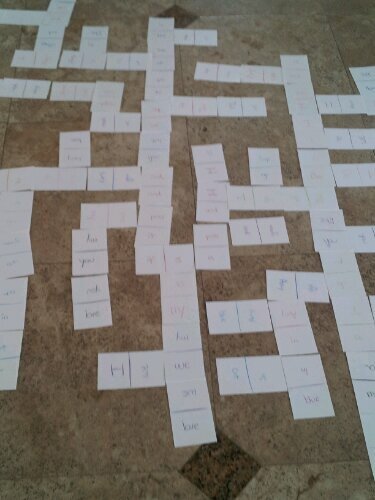 My matching game isn’t fancy, just index cards that I wrote the alphabet on (4x). 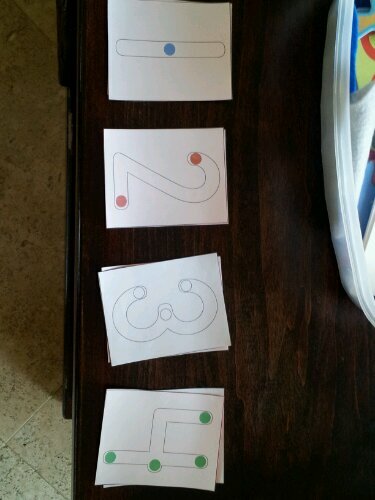 I could have done the number cards the same way, but I found these printable “touch” numbers that I just attached to cardstock. (I can’t for the life of me find the specific touch numbers that I printed out, but here are ones just like it.) Baby Miss is LOVING it. She’s getting pretty good at it too. We play it two different ways; one where she chooses a card and then finds the match, the other where I choose the card and she finds the match. Both work equally well. The family also already owned a alphabet/number puzzle that we have been using each week. I only bring out the letters and numbers that she has learned. The puzzle seems pretty old (hand-me down? ), but here is one similar. As for Little Miss, she and I have been hard at work on her sight words. She does get some “homework” from school, so we work on that each day, but I try to add an activity of our own to the mix too. Today we did sight word dominoes. It was a huge success. It got her reading and working with a ton of the words she has learned so far. 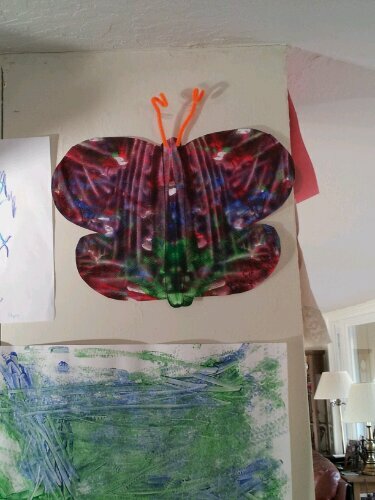 And she was super proud of the end result (she made me take a picture of it to send to her Mom and Dad). 🙂 I was super proud of her too. She worked really hard, but had fun while doing it. I made the dominoes set with index cards as well. Two words per card and I made sure to repeat the words on several cards so the game goes smoothly. I even threw some family names in there (Mom, Dad, her name, her sister’s name, and my own) which she got extremely excited about when she noticed them. 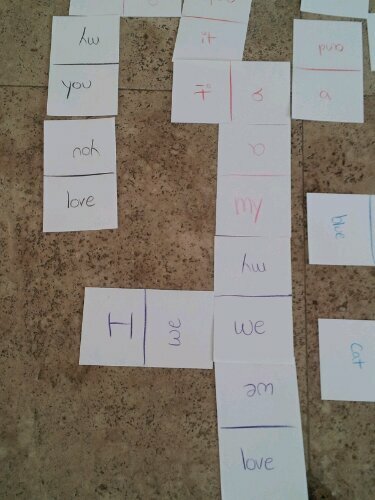 You could also make a memory game (just like I did with Baby Miss’ letter set) using sight words. Are you doing “letter of the week” this year? How’s it going? What activities have you done with your little ones that have been deemed successful? I would love to hear about it.